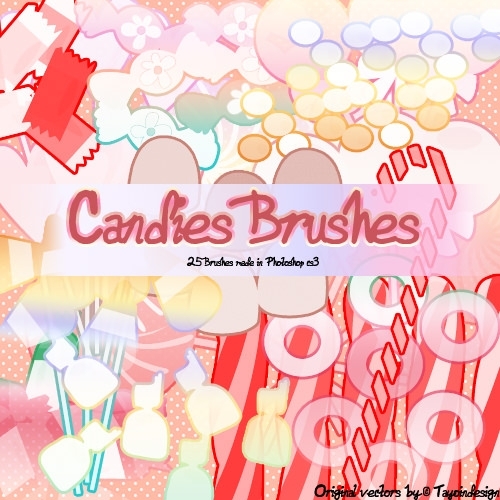 This sample of 25 candies Photoshop Brushes pack is designed on a pink background. 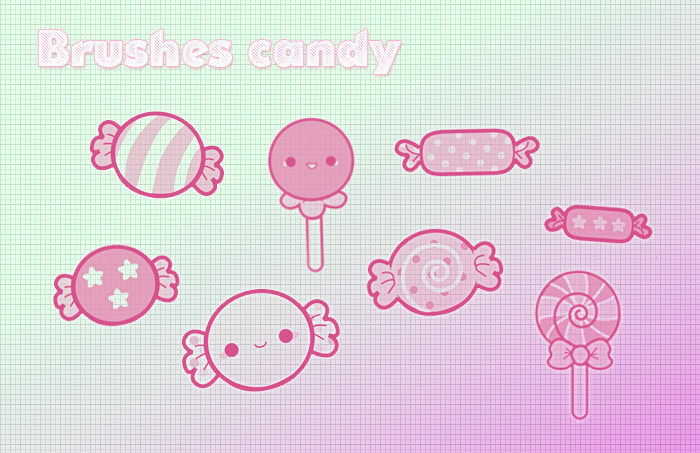 There are several different types of candies used in different ship, size and color. All the images intermingle to create a beautiful look. 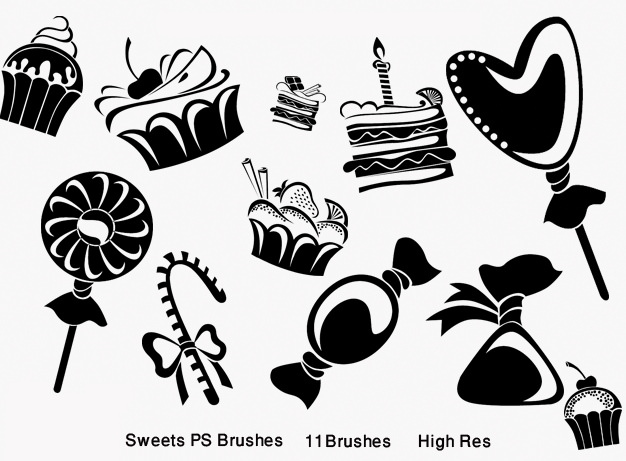 This image of 11 high res sweet Photoshop are designed entirely in black color putting special emphasis on the design besides candies other icons like the cake and heart shaped ornaments are also included in the design. 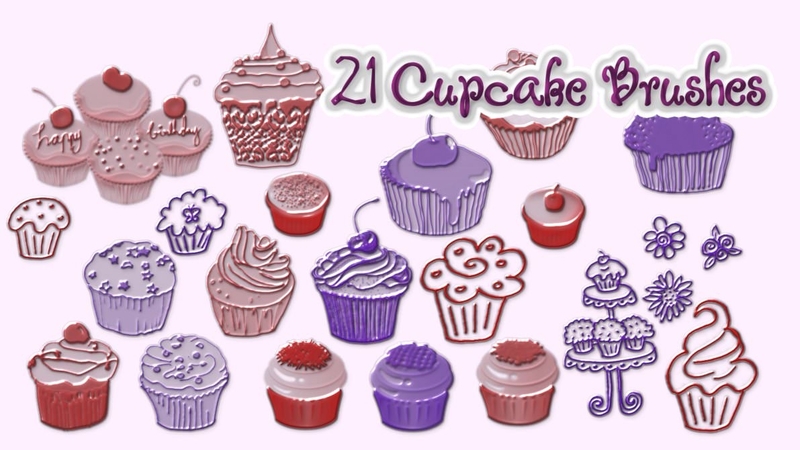 This sample of 21 yummy and tasty sweet cup cakes Photoshop brushes consists of only cup cakes from different categories. Each cake is significantly different from the other and can be used for decoration as well as designing purposes. 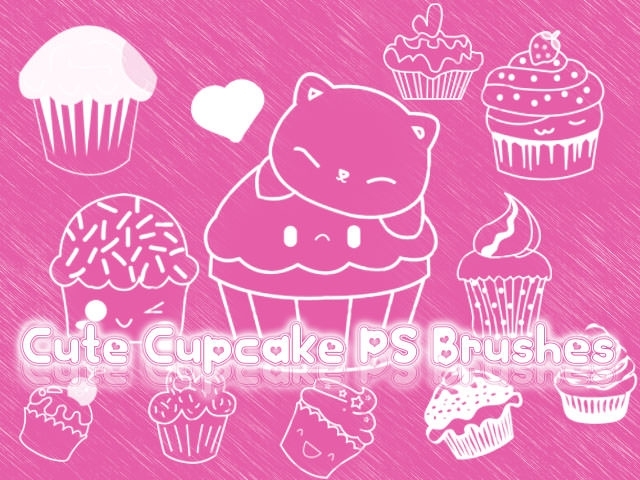 This image of cute cup cake brushes is designed on a pink background. The outline for cupcakes is drawn in white color. The images vary in shapes and sized. The central image consists of a teddy bear sitting on top of a giant cup cake, whack looks very cute. 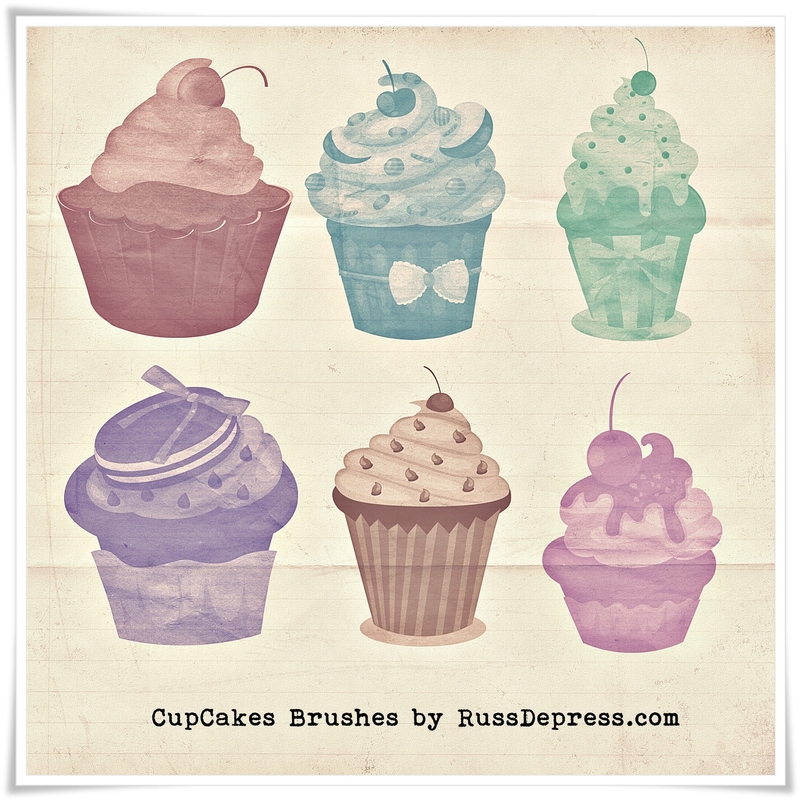 This design of 6 cup cakes brushes for Photoshop is designed one white background and is designed in 6 different colors. Each color is distinct and different from each other which give the template its unique appeal. This another design of pack of 8 free candy Photoshop brushes, which is completely designed on a pink background and has pink chocolates and candies strewn all over the template. This sample retro sweets shabby chic high resolution Photoshop brushes uses an old folded paper as the background. Images of different types of sweet treats are printed on the template. All the images have a vintage look and are designed in different colors. This template for grungy sweet candy wallpaper and brushes background uses a brown backdrop. Image on an ice-cream cone dominates the background. 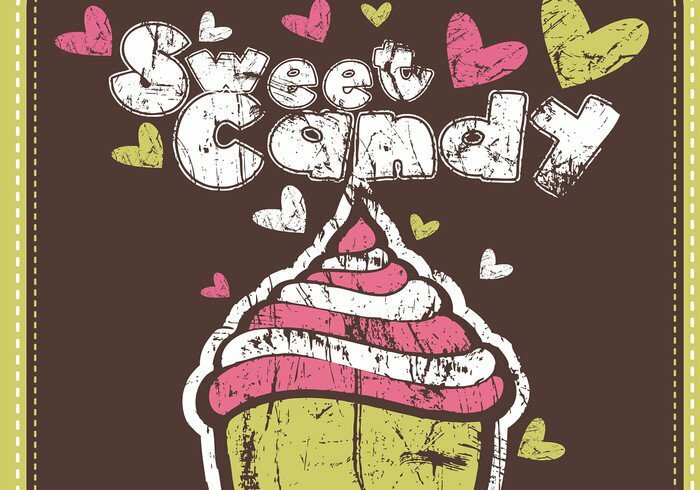 The word ’sweet candy ‘is imprinted on the upper portion of the template and several small hearts are drawn all around the image. 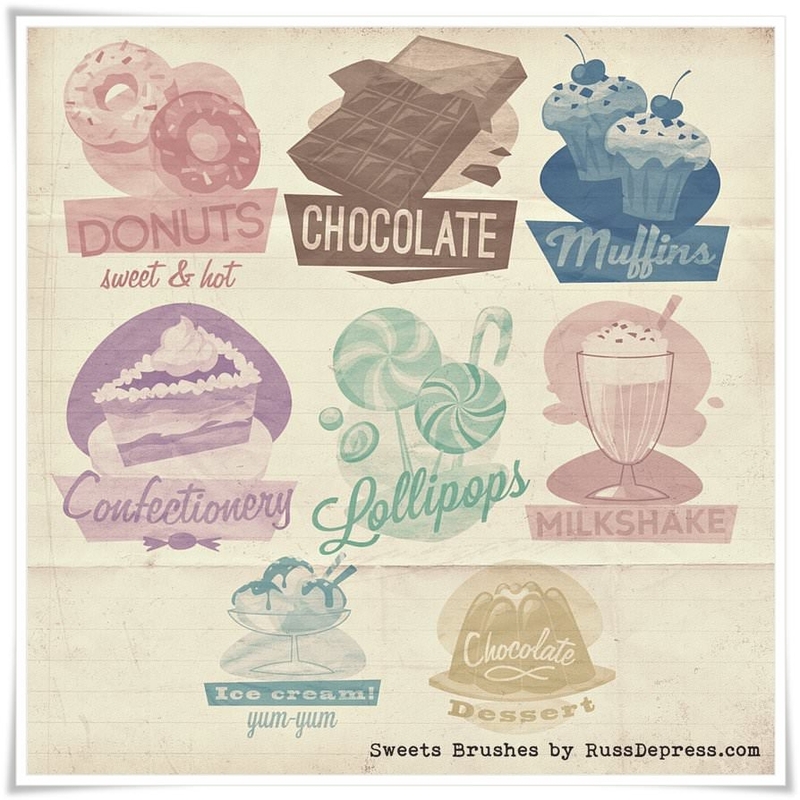 The yummy sweet Photoshop brushes are available in ABR file format. The design of this template is pretty simple and basic. 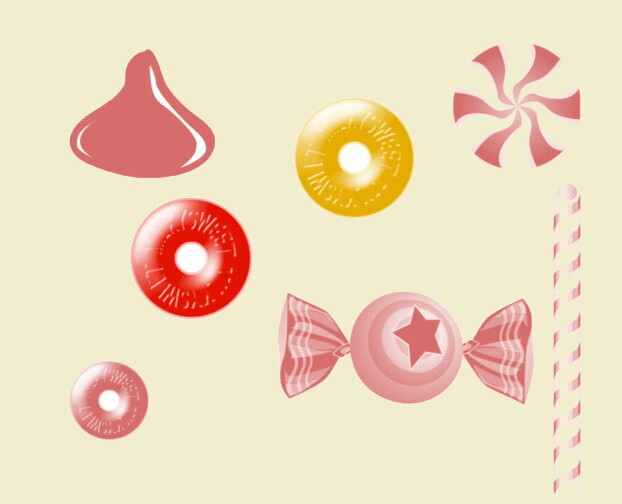 Several pink color candies features behind a white background which makes the candies a sight to behold. 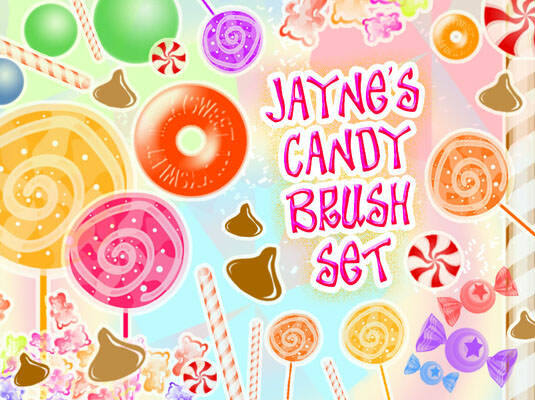 This sample of free candy brush set involves the use of multiple colors and shapes. Candies in various color, shape, and size appear on the right and left section of the paper. The middle portion is left blank where you can include a text of your choice. 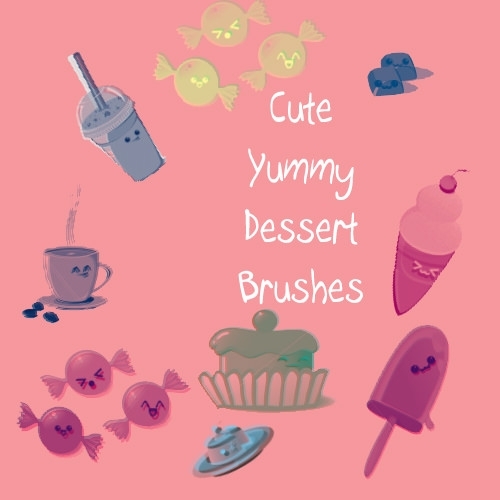 This template of cute yummy dessert brushes I s developed on a pink background. Images of cartoon characters are shown consuming a liquid drink, while images of candies, ice creams, and cake are seen on the same background. 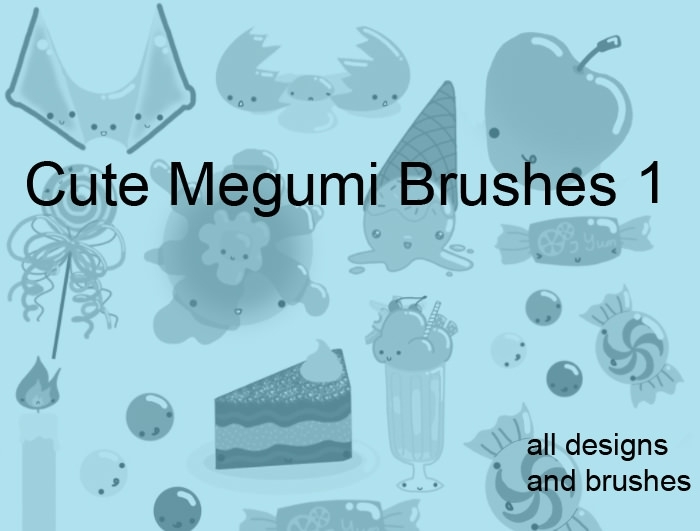 This sample of cute megmi brushes is designed in blue color. Several different types of candies, cakes and decorations as shown against the blue background which makes it look beautiful and elegant. This template is designed for someone who loves to play with colors. If you are looking forward to create a dramatic effect you can use these templates. As a user you can use one or several templates at a time to create a design that would stand out in the crowd.